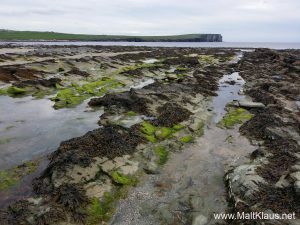 The Orkneys have been on the very top of the list of places to visit in Scotland for many years, yet I had never managed to do so – until 2017. It’s way up in the North of Scotland and not exactly easy, or quickly, to get to. 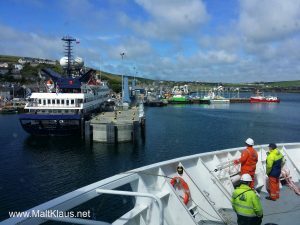 If you don’t want to depend on the small aircraft and don’t want to take the overnight ship from Aberdeen, there’s no other way than driving up the beautiful east coast of Scotland, to take the ferry from Scrabster to Stromness. That’s the route Jo and myself took in her little sports car, after spending the night in Inverness. The only stop was to enjoy a cuppa tea and a healthy (read: Full Scottish) breakfast along the way at a little tea room in Dunbeath. The ferry ride over to the “Mainland”, the name of the largest of the Orkney Isles, was rather unspectacular. The vessel took the longer, more sheltered route due to the rough sea. What started out as a rainy, cold day, actually turned into a quite pleasant and partly sunny day, when we disembarked the MV Hamnavoe in Stromness. Being the gringos we were, we decided to “head into town” first. Well, the streets in Stromness were seemingly built for horse-drawn carriages, not for cars. Very narrow streets, and people staring at us. Thank god Maizy is a very small sports car, so we did manage to find our way out of town and onto the main road. 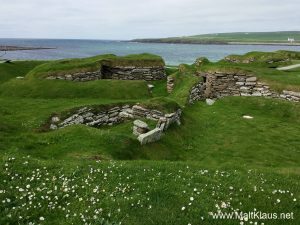 With time to kill before checking in at the youth hostel in Kirkwall, a detour to the prehistoric village of Skara Brae was a welcome change. We had spent many hours in the car and on board the vessel. Definitely worth the visit, the place has a kind of magical feeling about it that’s hard to put into words. Starting the visit on the island(s) by getting a sense of the history of the place gets you grounded and excited for more! 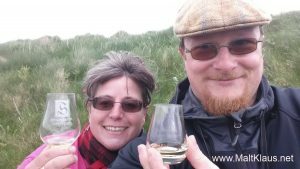 Enjoying a wee dram in the dunes isn’t a bad start to that leg of the journey as well. Entering Kirkwall, I was in for a bit of a surprise. Expecting the Orkneys to be somewhat like Islay, I did not expect to find a big Tesco store right next to a huge Lidl as some of the first things in town. It’s good to see the islands prospering, with opportunities, activities and perspectives for the inhabitants. 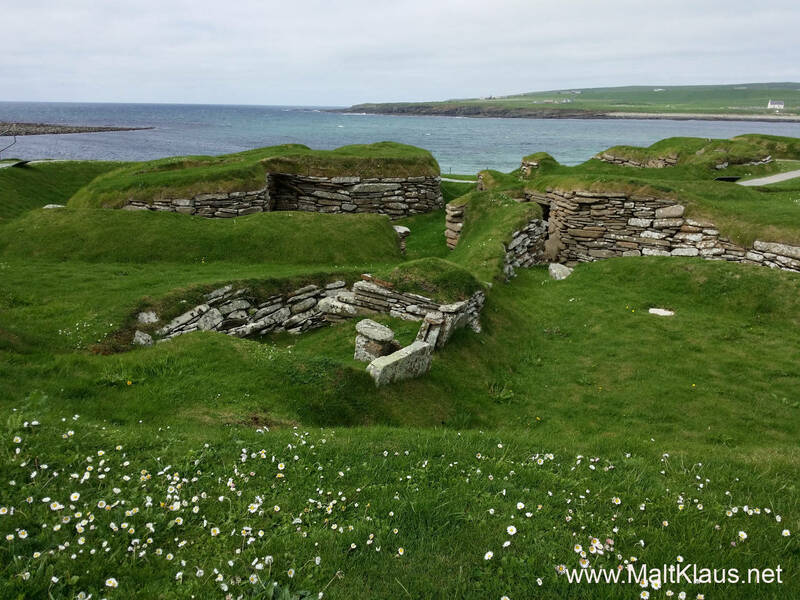 I could see myself living there, you get everything you need – well, at least in and around Kirkwall, I have yet to explore the more remote islands! Settling in at the youth hostel, a home-cooked dinner and an evening stroll around town later, we were ready for a good night’s sleep. 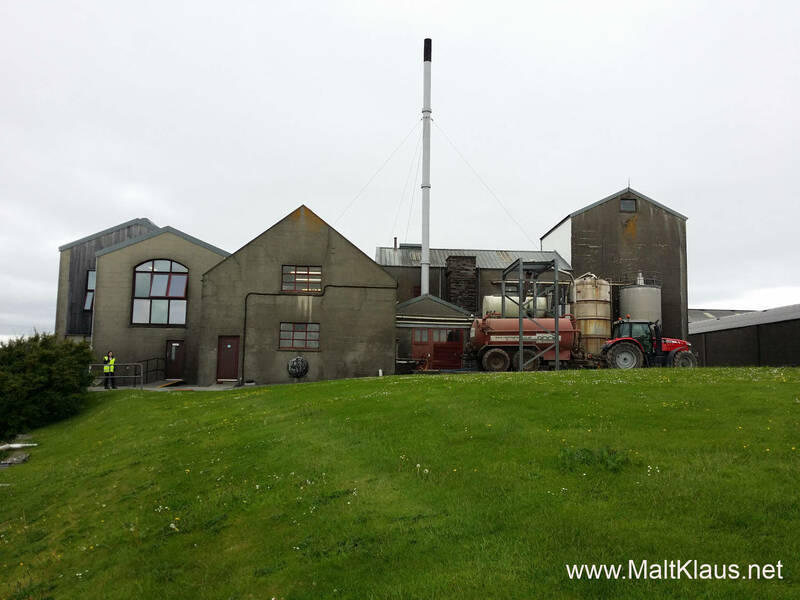 The first full day on the Orkneys lay ahead of us – and the first distillery tour! Scapa distillery has only been open to the public for two years and we were looking forward to visit the place ever since. Thanks to Chivas and Taryn for the invitation! If you’re visiting the distillery, take the coastal path, it’s a wonderful walk to the distillery (on a not too windy or dreich day, that is). Entering the visitor’s centre, we immediately noticed a lot of young Orcadians working there. 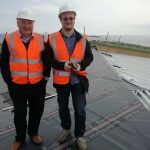 It’s good to see the creation of new jobs on the island. Our tour guide for the day was Erik, a very nice, young guy, who probably didn’t expect to learn a few new things from two old whisky geeks. Ahem, sorry about that. We shared the tour with a few Americans who spent the day on the island, having arrived on a cruise ship. 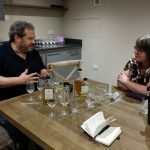 It was a first time for me to hear the question “what’s the difference between whisky and gin” on a distillery tour in Scotland. It’s easy to take things for granted when you’re in the know. There was no photography allowed anywhere inside the distillery – no exceptions, even for whisky bloggers. I’ll have to rely on words alone, then. Note to self: Do make sure you get photo permission the next time you plan distillery tours! The distillery is quite small, neat and tidy – I guess it got a fresh lick of paint and more before it being opened to the public. 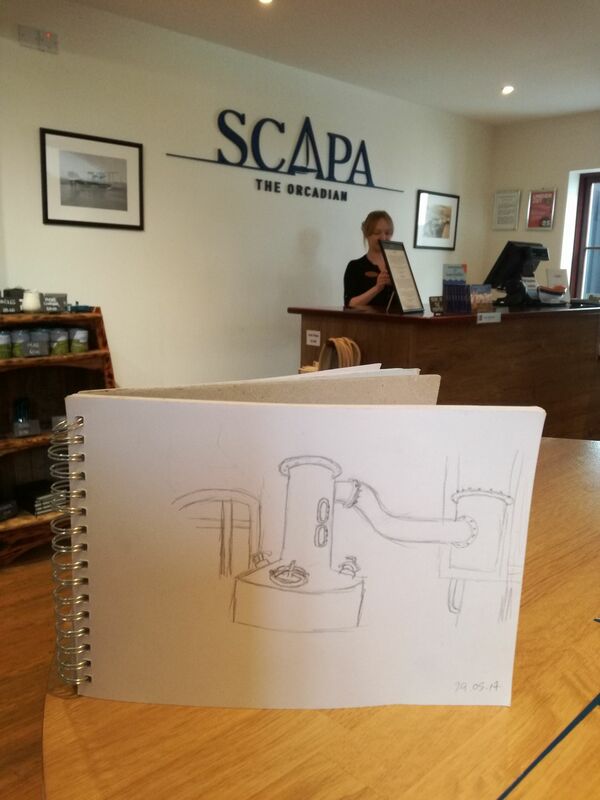 Scapa is not a huge super-distillery, but a rather small one, producing just over 1 million litres per year. Not much automation to see “no computers involved in the production” would be the phrase. Malt is, interestingly enough, brought in by lorry 2-3 times a week all the way from England (which I can vouch for myself, is a looooooong drive!). 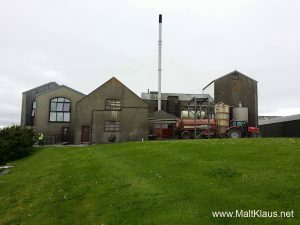 Scapa stopped malting their own barley a long time ago in 1966. Not too long ago (until 2014) they casked all the spirit on site. These days it gets tankered off the island, leading to about 30.000 casks maturing in Speyside, with 15.000 remaining on the island. I guess that’s the result of the production ramp-up after 2004, when they returned to full-time production. 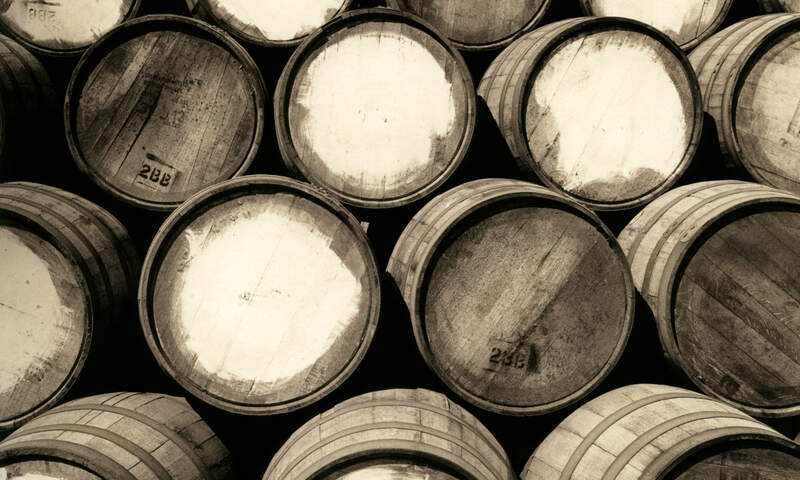 Between 1997 and 2004 there was only sporadic production with workers from Highland Park taking care of the distillery. 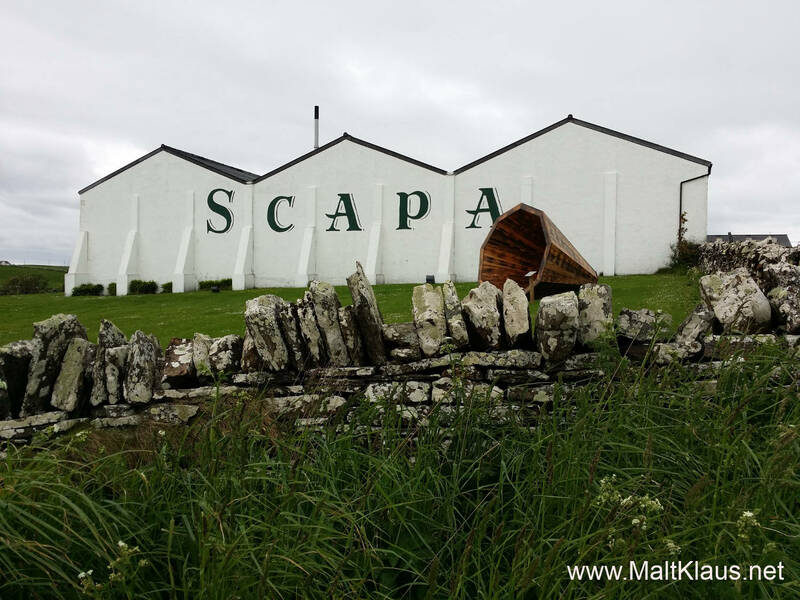 During that period, Scapa also had one of the longest fermentation times in the industry, well over 100 hours. This has since changed to a still respectable 80 hours, to create a fruity character. 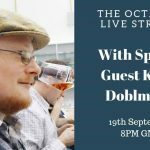 Has the change in fermentation times changed the dram? I can’t say – they claim 80 hours is the quickest they can do it without any noticeable change to the spirit. Spirit is the next keyword here. I would love to be able to share a picture with you, I don’t have one, but my friend Jo took the time to sketch it! The wash still is a Lomond still from the 1950s, which is a very rare thing to see in a whisky distillery. Actually, I believe this is the only (albeit modified) remaining Lomond still in use for the production of malt whisky. The different floors had to be removed, so it is just an oddly shaped still these days. Imagine a long, narrow cylinder as a neck sitting on top of a big, wide cylinder as a body, with a very narrow pipe as a lyne arm. Next up was a trip to the warehouse, where we got to taste a dram straight from a barrel. The spirit destined for single malt is matured in first-fill ex-bourbon barrels, which allows them to bottle it at a relatively young age. 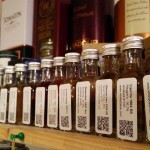 They make use of that, since currently there’s no single malt carrying an age statement in the Scapa lineup. Back in the visitor’s centre, we tried three drams, including the very fruity and quaffable new make. The others were the NAS Skiren and Glansa editions. I found the Skiren to be quite quaffable, not too complex, but an enjoyable, light, highly fresh-bourbon-cask influenced dram. Too bad it’s only bottled at 40% ABV – 43 or even 46 would give it a bit more of a kick. Then there’s the Glansa, which is a peated whisky. It’s not made from peated barley but is matured in casks which previously held peated whisky. My companion Jo (being the peat head) preferred that edition. I found it to be quite young in character with the peat smoke masking that. Just like the distillery got quite a bit of love and attention when they built the visitor’s facilities, I think the malt lineup needs a bit of love too. A few higher-end editions to make it more appealing to the “serious” whisky lovers would be a welcome sight. One step at a time, I guess! The distillery deserves it! If you’re on the Orkneys, I can recommend visiting Scapa – it’s different enough (not only because of the Lomond still) to warrant spending your time, and the folks there are very accommodating and friendly (can’t say that of all distilleries I’ve been to!). Oh, and they do have an exclusive 0,5l bottling of an older Scapa on the shelves in the visitor’s centre. 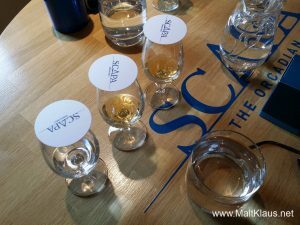 While I have seen displays of different half-litre bottles of single malt from Chivas’ distilleries in Speyside, I have only ever seen the Scapa sold at the distillery and nowhere else. No tour of the Orkneys can be complete without visiting some of the sights. (I usually go out of my way to avoid the overly touristy bits). After heading back to Kirkwall for a light lunch and ice cream (enjoyed in the sunshine! 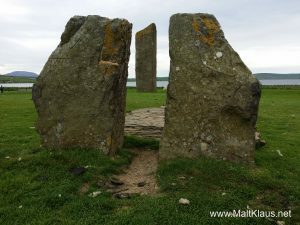 ), next on our list was to visit the standing stones of Stenness and the Ring of Brodgar. The weather was nice enough (meaning not too harsh winds and no rain), which is not always a given on these islands. Predating Stonehenge by quite a bit, thes standing stones are quite a sight. The mind boggles. Who put these huge stones there – and why? Oh to have a time machine and find out more about them! When you look close enough, some of the stones even feature old graffiti, carvings left by people decades ago (or even longer). 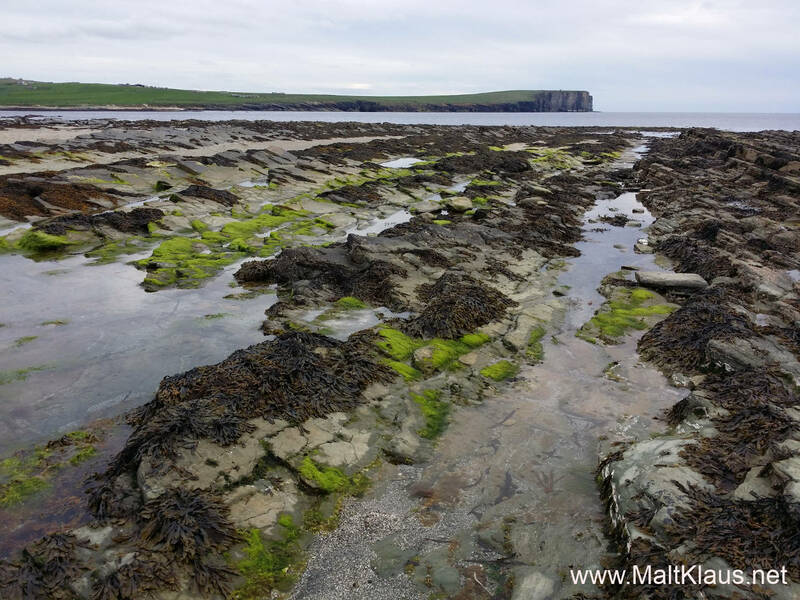 After a stop at the ruins of the once quite magnificent Earl’s place, the next destination was Birsay beach. A feast for the eye, and perfect for some photography and looking for shells in the sand. Oh, and I nearly forgot the Orcas we saw near the beach – the first time I had ever seen any, what a spectacle! Standing stones of Stenness – beware of the sheep droppings! As it was getting cold and slightly damp, another home-cooked meal back at the very recommendable youth hostel was just what we needed. Enoying a few beers on the couch in the comfy back room followed. 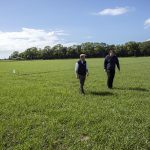 An eventful and enjoyable day was behind us and when it was finally time to head to bed, we were looking forward to visiting Highland Park the following day. But that’s another story! Compliance notice: We toured Scapa distillery by invitation from Chivas (thanks a lot, Taryn! ), with full editorial control over the article retained and travel expenses paid for by myself. Article updated on 21st of July 2017 to include a sketch of the Lomond still.